Harrison was a typical frontier town with dirt streets, wooden sidewalks, and false front buildings. 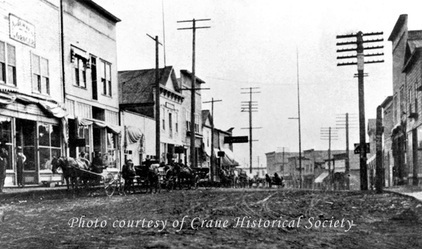 The Village of Harrison was Incorporated July 21, 1899 and grew to about 2,000 residents during its heyday. Harrison's Main Street (Hwy. 97) looking south in 1910. Left side: August & R.S. Jensen Brothers Grocery, Corskie Drug, Ed Harris Barber Shop, Jimmy Jones Cafe, Telephone Office, E.C. Ribstein Hardware. Right Side: Lamb's Blacksmith Shop, Lafferty Bakery (tall bldg. ), Opera House, Frank Smith Pool Hall. Harrison's main street looking north. The building on the left is The Mint, a popular saloon with rooms upstairs. It stood where the playground is in city park. The mint and eleven other buildings on this block burned in the 1917 fire. In 1740 Coeur d'Alene Chief Circling Raven foretold the arrival of men in black robes with powerful medicine. One century later, the prophecy was fulfilled and the first Jesuit ﻿Mission of the Sacred Heart﻿ was built 12 miles south of Harrison. There is an interpretive sign that commemorates the spot on Hwy 3 (White Pine Scenic Byway) and Mission Point Rd. Capt. John Mullan and his men traveled through the same spot in 1859, as they built the Mullan Military Road that connected the Missouri and Columbia Rivers. Much of their road in this area follows SR-3. You can walk on part of the original unimproved road in Heyburn State Park. An interpretive sign in the tent campground marks the entrance. In those days, the Indians wintered their wild ponies on Harrison Flats. There was a tribal village called Alkwari't at the mouth of the Coeur d'Alene River, named for how the sun sparkles on the water here. Gold was discovered in the Coeur d'Alene mountains in 1882. The stampede began in earnest in the winter of 1884, and part of it came through Harrison. Prospectors with grubstakes acquired in Spokane and Coeur d'Alene rode steamships to the southern part of the lake, then turned up the Coeur d'Alene River at Harrison to the head of navigation at present day Cataldo. From there, the trek to the boom town of Eagle City was completed on horseback or by foot. Wyatt Earp and his wife Josephine were among the hopeful seekers who took this route to the gold fields in the Coeur d'Alene Mountains. The gold mines and subsequent silver strikes near Kellogg were located in territory controlled by the Coeur d'Alene Indians. The pressures of civilization threatened their security so the priests encouraged tribal leaders to sign an agreement for a reservation. The influx of settlers continued unabated and the chiefs signed another agreement in 1890 to cede the northern part of their reservation to the Federal government. Most of the Indians moved their activities to farmlands on the west side of the lake at that time. The sign at far left says "Hotel Harrison." This hotel stood on Lakefront Dr. directly across from the waterfront where trains and steamboats took on passengers. But we're not sure if this is that particular Hotel Harrison. 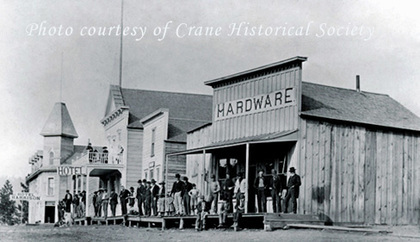 Silas and Elizabeth Crane arrived in 1890. The place was called Spring Point and Willow Springs at the time. The couple stayed in a rough log cabin with a dirt floor while they built Harrison's first house. Their three sons, Addison, William, and Edwin, arrived the following year and filed homestead claims on what is now Harrison. So much traffic went by their doors to and from the mining region that the Cranes opened a general store. By August 1891, Addison Crane began recording 99-year leases for individuals who wanted to build on his homestead land. This plaque was designed when the new Hwy 97 bridge was installed over the Coeur d'Alene River. Two plaques were supposed to decorate either end, but they are now in the possession of the Crane Historical Society. Open Memorial Day to Labor Day on Saturdays and Sundays from noon until 4 p.m. Free admission/donations accepted. Free parking. 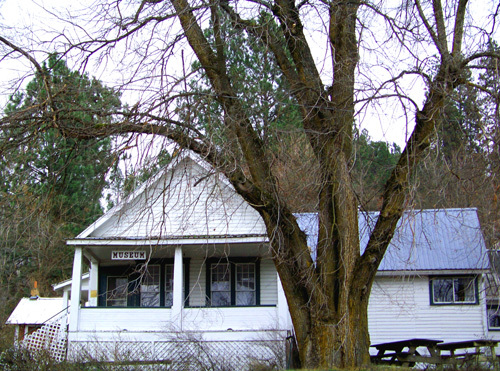 ﻿Artifacts and memorabilia from Harrison's history are preserved by the Crane Historical Society, whose volunteers operate the Crane House Museum. Here you can see models of three of the steamships that served Harrison: The Flyer, The Georgie Oakes, and The Harrison. The museum collection includes furnishings and memorabilia from historic Harrison, a lumber mill steam whistle, and thousands of digitized historical photos, as well as CD recordings of settlers who describe details about life in the region during the first half of the 1900s. There is an outdoor display of equipment from Harrison's mills. The old Harrison Jail is on display as well. A huge Russian elm tree shades the front yard, with a plaque that says it was planted by Gov. N.B. Wiley, second governor of Idaho (1890 - 1893). Harrison Still On the Reservation! An embarrassment occurred when the settlers realized the land they were building on was still part of the Indian reservation, not in the public domain. Working with Congress and tribal leaders, town representatives were able to resolve the issue, but it took a number of years. The final legal homestead patents in the town site were not completed until 1909. Meanwhile, Harrison's timber industry took root in the 1890s and was booming by the turn of the century. Harrison's location was ideal to profit from it. Tugboats pulled millions of board feet of logs down river to Harrison. Building occurred at a frenzied pace, and soon the waterfront was packed with lumber mills, shingle mills, and factories. The regional lumber industry was generally stable, but labor relations became tense as the Industrial Workers of the World agitated for improved conditions. The Wobblies led a major strike in the summer of 1917 that paralyzed the entire Pacific Northwest and half the region's timber workers were off the job by mid-August. The water provided convenient transportation in this region, where old growth forests were so thick that wagons had difficulty passing through and sometimes even had to be disassembled and the parts carried. Canoes and bateaus were the main watercraft before steamboats arrived. The paddle wheel steamers carried freight and passengers on the lake and the rivers that feed it. Some of the boats had furnishings considered elaborate for the day, with electric lights and upscale dining rooms. 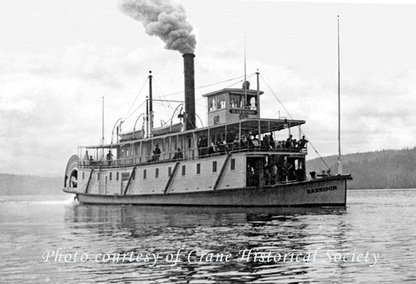 Lake Coeur d'Alene had a greater concentration of steamboats than any other lake west of the Great Lakes for a time. 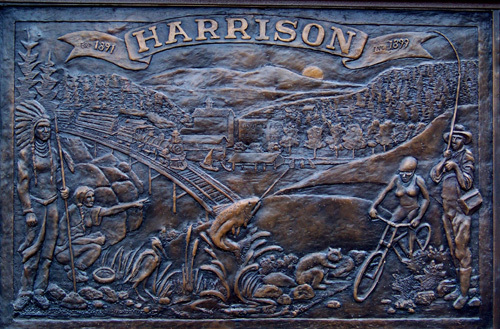 When the O. R. & N. Railway came through in 1890, Harrison became an important transportation hub that connected cities, farming communities, the mining district, and the lumber industry. Spokane, Coeur d'Alene, Tekoa, Kellogg, Wallace, St. Maries, and St. Joe City were all accessible via Harrison. 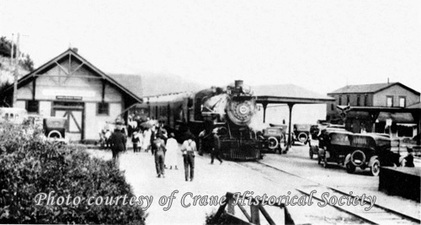 Trains ran through town twice a day both ways, serving about 1,000 passengers daily during Harrison's most prosperous years in the early 1900s. Harrison's train depot was below Lakefront Ave. Steamboats pulled in at a dock here as well. The house on the right is Pete's (Pete the Greek's) Dockside Restaurant, formerly Burley's Dock Cafe and Bar. Pete had a steam-powered peanut butter and popcorn machine with a whistle, and he put it on the dock when the trains came in. 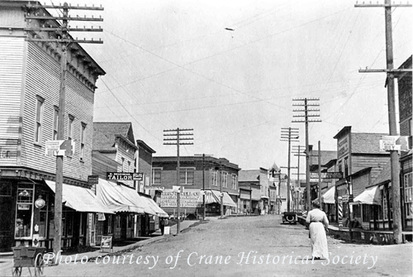 Note: Crane Historical Society photos are available for purchase. Drop them a line or stop by the Crane House Museum during visitor hours. This is where you can set us straight. If you see errors in this story, please submit your comments or corrections here. Please use "Frontier Town" as a heading to your comment. Thank-you!